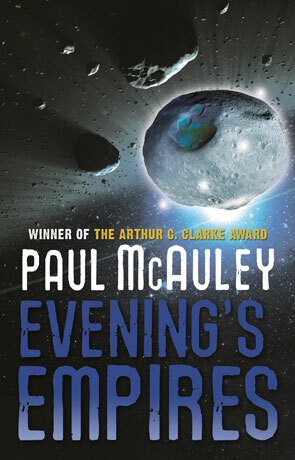 Evening's Empires is the fourth novel set within the Quiet War series, although it is pretty much a stand-alone story in that universe and can be enjoyed without any prior knowledge of McAuley's works. The story follows Hari, a young man who has narrowly escaped kidnap (or worse) and as we join him finds himself stranded on a almost completely barren asteroid with only his semi-intelligent spacesuit, some very hardy space-plants and the decapitated head of a prominent scientist for company. His family are presumably killed - the perpetrators still at large and searching for Hari and accompanying head along with the secrets they may hold. Hari wants to learn why these people want him and the head so badly, he also wants to get his families ship back - the only home he's ever known. In many ways this book feels like a modern classic, like a story from the golden age of science fiction but brought up to date with a 21st Century view of the future and more effective characterisation. I love how McAuley makes use of his richly developed future universe to create a much more personal story that still manages to evoke feelings of awe, of the vastness of space and the beauty of a post-solar, sometimes post-human existence. This approach works incredibly well and the only recent novel I can compare it with is Adam Roberts Jack Glass - there is the same sense of intelligent, dynamic story-telling in a rich future universe. This similarity extends to the way that the solar system is described, that everything from the planets to small moons and bits of rock are much more interesting than we could ever possibly imagine and that human expansion to populate our wonderful solar system is simply a matter of time. The author's ability to imagine such a detailed and plausible future universe matches anything else out there and effectively describes future tech without losing the layperson in techno-babble. The story is incredibly rich and told in a remarkably effective manner; using the backdrop of the Quiet War universe adds a great deal and as ever McAuley describes momentous events in a distinctive and dramatic manner. I love how even though this book is great as a stand alone, if you've read the previous novels you will see results of some of the events. This includes a transcendental moment for humanity - brought about due to the events that took place in the previous novel "In the Mouth of the Whale" - The Bright Moment which every human in existence witnesses at the exact same time, reaching across time and space. Sharing in this "wow" moment is an incredibly humbling experience and a testament to McAuley's story-telling ability. Few books have managed to evoke such feelings of vast scale and momentous events. Evening's Empires is everything you could possibly want from a science fiction novel, from the grand visions to the plausibility to the engaging story this book hits all the right notes. It's also firmly rooted in my memory as one of the best. Written on 5th September 2013 by Ant.